Analyses for naturally occurring biological substances or administered materials have been with us for many years. These were usually based on the physical or chemical characteristics of the substances to be measured. However in recent years there has been an explosion of interest in analytical methods which made use of the high specificity and sensitivity of im- munological reactions. These methods can be very simple in terms of technical procedures and can usually be performed on minute samples of biological fluids - factors which have ensured their ready acceptance in most laboratories. Recently there have been numerous meetings on technical aspects of particular immunoassays and on their application in specific diseases. We felt however that the time was ripe for an 'overview' of the whole field. 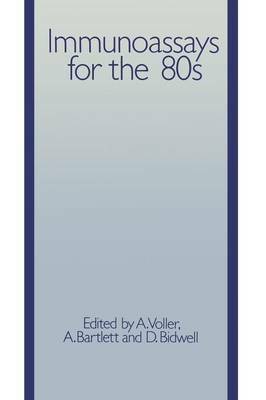 To this end a conference on 'Immunoassays for the 80s' was held at the Zoological Society of London in 1980, and this book is largely based on that meeting. Both the immunoassay techniques and their numerous applications were discussed and are dealt with at length in this volume. The editors wish to thank all the contributors for their chapters and to acknowledge the debt they owe to Jean Ryan (NLCM) without whose organization and assistance this volume would not have been completed. A.V., D.B., A.B.